The sport of disc golf has an interesting history. Back in 1926 a few elementary school friends gathered in a school yard to throw “Frisbie Pie” tins. They called this game tin lid golf. Yes, they were using a pie tin that came from The Frisbie Pie Company located in Connecticut. A man named William Russell Frisbie not only made his pies famous, but his pie tins quickly became known as a fun way to pass time. Who would have thought that the modern Frisbee has its roots from a tasty desert? It wasn’t until the 1960s that the sport of disc golf became formalized. Even before the invention of the modern disc golf target, or basket, tournaments were held where the players would throw at trees or into 50 gallon drums. There are two figures that stand out as the pioneers that have made disc golf what it is today: Dave Dunipace and “Steady Ed” Headrick. Dunipace is known as the inventor of the modern disc golf disc. His design of discs enhanced the flight of Frisbees so they were more suitable for shaping different shots needed during a round. “Steady Ed” Headrick brought to the sport a recognizable target. You may have seen these targets in a park and were unsure what they were. Headrick invented a metal target that catches these discs out of the air using chains. Now, disc golfers complete the hole by landing their discs in the basket, rather than simply hitting trees. When we fast forward to today many people may still not know much about the sport, but that is quickly changing. In recent years disc golf has been mentioned on shows like The Office and Seinfeld. Disc golf has also made numerous appearances on ESPN’s Top 10. The tournaments are getting bigger and having better media coverage. The sponsorships are getting better for players and for many, disc golf is their full-time career. Now, there are more than 4,000 registered disc golf courses in the world, but none of them are in Pickens County. It is an exciting time for disc golf! So, how did a disc golf tournament get to the Joy House? It all started with our partnering churches investing into our ministry here. Revolution Church heard that The Joy House was interested in designing and installing a disc golf course on our beautiful property. They got us in touch with Nathan Skinner who is a sponsored player for Discraft. Nathan came out to visit our boy’s home and was such a blessing to them as he shared his story. That night he pitched the idea of having a fundraising tournament on campus in March. Since that night, the boys and myself have been working hard to prepare the property for a course. On March 23rd, the campus will have disc golfers from all over come to compete in The Joy House Open. 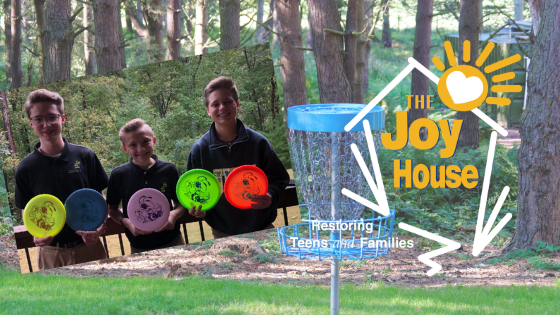 The Joy House Open is a charity fundraiser event via the Professional Disc Golf Association (PDGA) Competition Endowment Program to raise funds to install permanent baskets on The Joy House campus. All competitors will play two rounds of 18 holes. All PDGA rules will apply. There will be no two-meter rule. $500 has already been graciously donated to the Pro Purse. Amateur divisions will be Trophy Only. Amateurs will also receive a player’s pack of at least a $40 value. Ace pot: $2 entry – If no aces are hit, there will be a throw off after the tournament rounds are complete. There will be a raffle for prizes including a Discraft Chainstar Lite portable basket ($150 value), a pair of First Run Paul McBeth Luna putters ($40 value), an InZone Kwik-Stik Combo ($60 value), a set of Paul McBeth Signature discs ($80 value) and more! Tickets will be for sale for $1 per ticket. All raffle proceeds will go to installing baskets at The Joy House. The Joy House is fairly isolated from any restaurants or fast food. Smokin’ Chefs will be on site at The Joy House providing a BBQ lunch. Lunch is not included in your entry fees, so please bring cash to pay for lunch. Thank you to our sponsors below. We couldn’t do this without your help! How can you help if you don’t know anything about Disc Golf? Join a scheduled work day with us, or bring a crew out to help us. Contact Nick Richardson at (502) 565-5354 for more info. Become a sponsor for the tournament. There are some upfront costs that will be needed. Come out to help on March 23rd. Hand out water, take trash away, help with lunch, etc. A “T-Fence Post Puller” from Tractor Supply $39.99. We know this day will be a huge success! Please be in prayer for us as we prepare for this event.